Receive news about Rock Symphony and the Progressive Rock Scene. Finally available: Apocalypse´s DVD "Live in Rio"
Univers Zero: 7 new titles added to our store !!! Le Orme, new titles included and old titles back on stock: 'Contrappunti', 'Uomo di pezza', 'Collage', 'Storia o Leggenda', 'Verità nascoste', 'Smogmagica', 'Florian' and 'Piccola Rapsodia Dell´Ape'. Italian novelties, part 1: Jumbo, Alusa Fallax, Opus Avantra, Semiramis, Agorà, Maschera di Cera, Capsicum Red, Odissea, De De Lind, Flea, Uno, Ibis, Latte e Miele and Corte dei Miracoli. 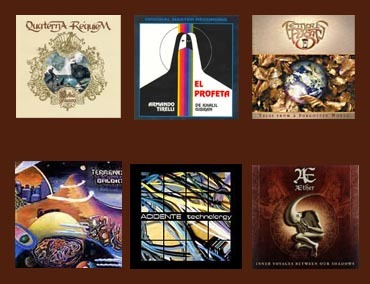 Mellow Records items back on stock, parte 1: Cooperativa del Latte, Germinale, Edhels, Haikara, Barrock and Azazello. New albums from Chile and Canada! Check out the new items. 13 new CDs from Musea, including the triple CD-box Odyssey, and new copies for old classics like Trace.